I couldn’t help but dub this one Husband Approved Zucchini Parmesan after this recipe totally won my other half over! Serve it up as a tasty appetizer or a delicious dinner complete with zucchini noodles! My husband has been begging for chicken parmesan for what seems like weeks now. Literally BEGGING. Puppy dog eyes, pouty lip, and all. I typically toss a bowl of Chicken Parm Soup his way when the whining starts, but this time around I thought it would be more fun to tease him. J: Babe, I’m gonna make you zucchini parmesan. J: Shhhh… It’ll be delicious. You’ll love it. P: Don’t do it, Jenny. If the title of the post didn’t tip you off already, spoiler alert: he loved it! Not only did he love it, but he continued to gush and sing it’s praises all through dinner. P: Next time you make this we should totally try it as an appetizer. With dipping sauce? Marinara? J: I ate five right out of the pan dipped in ranch. I think it’s safe to say we’ll be having this again ? 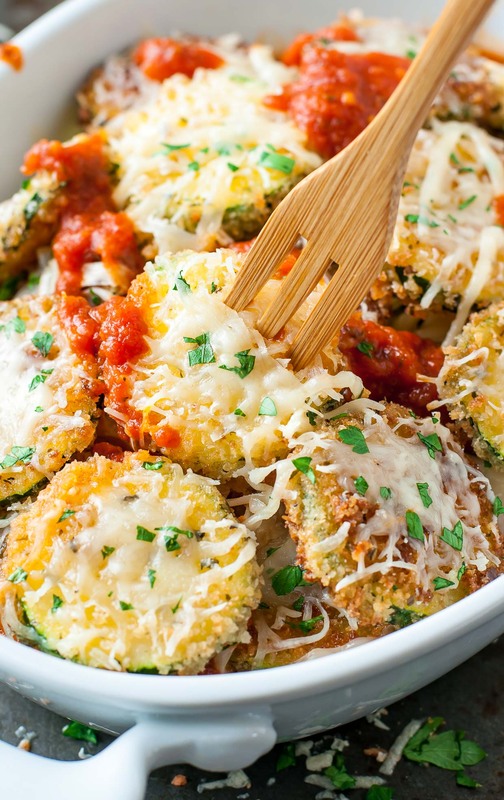 Serve up these ultra crispy zucchini parmesan as an appetizer with your favorite dip or follow the tips below for turning them into a delicious meal! Serve it up as a tasty appetizer or a delicious dinner complete with zucchini noodles! Slice zucchini into 1/4 inch rounds. Set up a small bowl of whisked egg and place panko and flour, respectively, on small plates. Season your panko if desired (I did!) Also line a large plate with paper towels and set aside. Working in batches, dredge the zucchini discs in flour then dip in the egg mixture, then the panko. Repeat for all. Heat oil in a large skillet over medium-high heat. Oil starts to shimmer when very hot and can be tested by dipping the edge of a zucchini disc in the oil. If it sizzles excitedly you're good to go! Cook about 5-7 at a time, careful not to overcrowd the skillet. Pan fry until gold and crispy, approx. 1 minute on each side, using tongs to both flip the zucchini and remove from the skillet. A large fork may be used in place of tongs if necessary. Transfer to paper towel lined plate to catch any drips of oil. Transfer to a greased or parchment lined baking sheet and top with your cheeses. Bake (or broil!) until cheese is hot and melty. Sprinkle with chopped parsley for a colorful garnish. Serve immediately dunked in marinara or ranch, or atop a bed of fresh zucchini noodles with spaghetti sauce. Enjoy! optional extras: season your panko with dried or fresh! herbs of your choosing. Italian seasoning blend is great for a speedy burst of flavor. Dried basil, oregano, and garlic powder also taste great! 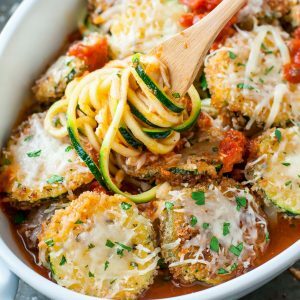 If pairing your zucchini parmesan with zoodles, you'll also want to snag your favorite homemade or store bought spaghetti sauce and an extra zucchini to spiralize into veggie noodles. A julliene peeler or veggie peeler will also work to make noodle-like strands! You can absolutely, positively bake these bad boys instead of frying. I will admit that I’m super duper in love with the pan-fry technique in the recipe card above. It reminds me of a fancy Italian restaurant and takes me to my comfort food happy place. I hardly ever fry ANYTHING so this was a total Treat Yo’self 2017 moment here! DELLICIOUS! 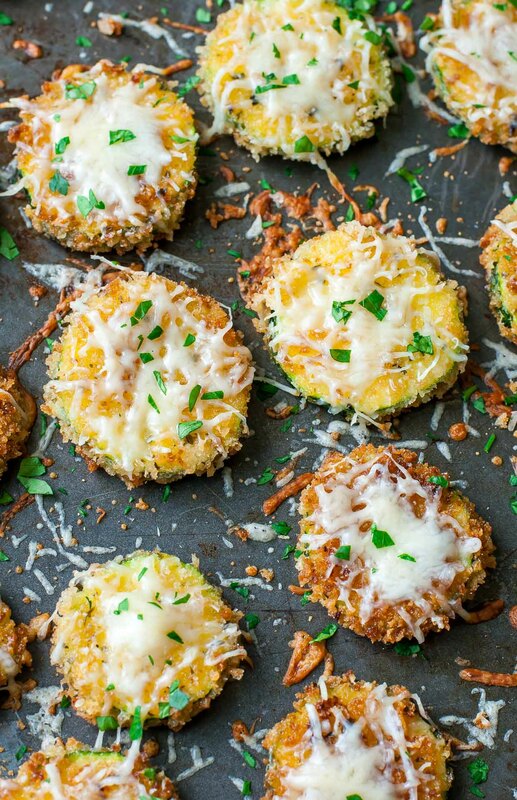 But baked zucchini chips is totally a thing! And crispy! Now turn on that oven and get baking! 1. Cover zucchini slices with a layer of Parmesan cheese and season as desired (Italian seasoning blend, dried basil, garlic powder, salt, pepper, etc…) then bake on a lightly greased or parchment paper lined baking sheet at 425 degrees Fahrenheit for 15 minutes or until golden brown. 2. 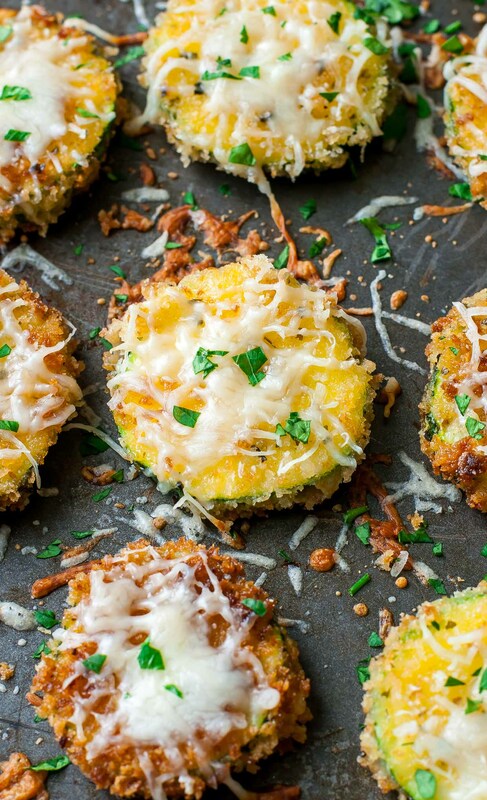 Since we’re baking instead of frying, skip the flour in the recipe card above and simply use panko and parmesan cheese with any seasoning of choice (Italian seasoning blend, dried basil, garlic powder, salt, pepper, etc…) Pre-heat oven to 450 degrees F, dip each zucchini round in egg, then in the panko mixture, and bake on a greased or parchment lined baking sheet for approx 25 minutes until crispy. When they’re done I adore topping the panko crisps in a little extra cheese and popping them back in the oven on broil for 2 minutes or so until melty and swoon-worthy. Feel free to follow suit! 3. Same as panko method above but with regular breadcrumbs in place of the panko. You can grab the pre-seasoned ones at the store or make your own using dried herbs or you go-to Italian seasoning blend. Easy peasy! For this method you can use GF breadcrumbs and skip the flour. 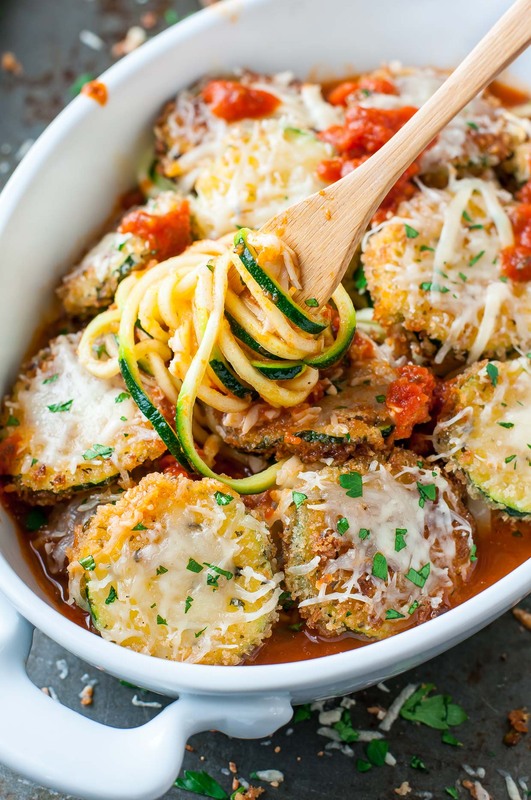 Hope you love this Husband Approved Zucchini Parmesan as much as we do! I am so excited about this recipe! My husband is allergic to eggplant so subbing in zucchini is brilliant! This is the perfect recipe for all my summer zucchini! I’m so excited to make this!! DOES ANYONE KNOW WHAT THE CALORIE COUNT IS FOR THIS RECIPE??? Wow! This looks delicious! I can’t wait to try! 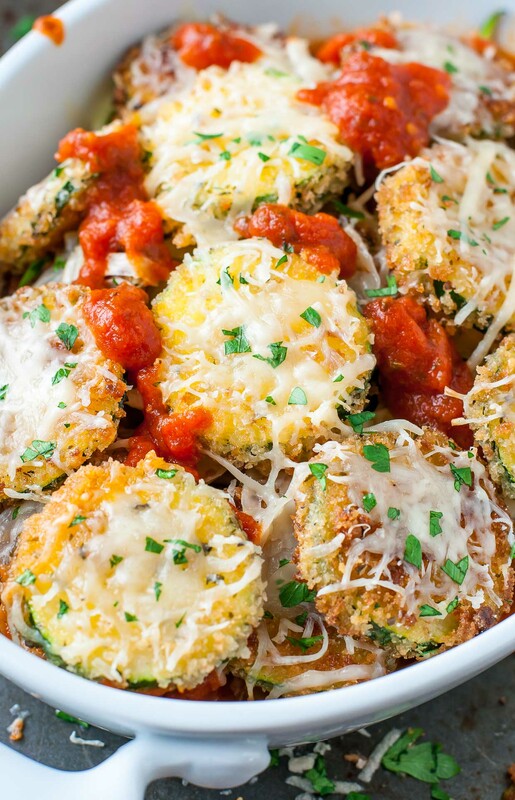 Zucchini is one of my favorites, so obviously this looks perfect! Thanks Brooklyn! 🙂 Mine too! — I love how versatile it is and it goes with essentially everything. Nice! I’m lovin’ this meatless version. I also like how you called it “husband-approved,” because we all know how stubborn they can be when they *think* they don’t like something. The stubbornness is real! Thanks Annie! Hope y’all get a chance to try it! Thanks Rachael! It was delicious!